Are you looking for unconventional tips for email marketing? Do you want to crush your competition? Then you will find this guide super useful. Furthermore, if there is something worth doing consistently next to search engine optimization is Email Marketing. Email marketing is still one of the most effective and direct ways to connect, nurture and convert the subscribers into customers. There’s a reason why I say so. I am data driven person so I went on to dig some data to support this post and here top 11 astonishing stats that I found in my research. 91% of users check their emails at least once every day. 23% of users who open an email on the mobile device, will open it again later. Email subscribers are 3 times more likely to share and/or buy your product/service than those users coming from other sources. 74% of the marketers say that with the help of email marketing, their customer engagement has increased tremendously. Having said that, I’m sure you now know how important email marketing is. Almost 50% of the population on earth has at least one email account. Even if you hit a very very very small fraction of this number, you will reach significantly a very large number of people than you could have reached by any other method. But to begin with, you must know about email marketing. So let’s begin. If Internet marketing is a building, then email marketing is one of the strongest pillars of its foundation. It is an effective way to keep in touch with your audience and keep them posted about your work. Be it blog posts, videos, events, webinar and what not. If you have a reader becoming a subscriber to your work, then take them seriously. One doesn’t simply give away their email ID. Furthermore, if everything goes right, you can successfully turn a prospect into a buyer, and even a loyal fan of your work. Adding to this, email marketing is so powerful that your business can still run while you are asleep. You can get closest to your subscribers on the list by reaching them through an email. Obviously, since you are getting almost in a one-to-one talk with your subscribers, you should maintain that space and not spam them. Maintain certain etiquettes while delivering your content or message through an email. I can keep talking about this but let me break the ice for you and get into little more detail on this topic. As you must have seen in the stats that a message is more likely to be seen in an email than on Facebook or any other social media. Hence email remains unbeatable even after a social media revolution taking over people. Where almost half of the human population already have at least one email account, let alone multiple accounts. Although there are multiple reasons why you should spend time and money on email marketing, here are top 3 reasons to convince you. #1 An Email is the number one channel to deliver your message: Going by stats, 91% users check their email at least once every day. Isn’t this amazing thing to consider to deliver your message to your list? No other channel is even close to this number. #2 You have your own user base: No doubt platforms like Facebook, Twitter, Quora, Medium etc have a huge user base, but that’s not yours. An Email list is something you have built from scratch and you own it like a boss. You have earned it by your work. You own it and no one has any control and cannot take it from you ever. Those leads are yours, forever. #3 Better conversions: Marketers have found 760% increase in sales and 74% increase in user engagement. Thanks to email marketing. ROI through this channel is 3800%, which is insane. Furthermore, a user is 3 times more likely to share and/or buy your product or service. It is not astounding that many affiliate marketers do their business ONLY through this channel. No blog or a website. Out of many email marketing software, I have found some of the top quality and easy to use software that will take a lot of burden off you. However, I do not recommend to buy an Email list, though it is a great shortcut, to begin with. Another thing you definitely should avoid is adding email ids of people you meet at conferences. Without explicit consent, I recommend to not do this. The correct way is to build the list by having a sign-up or opt-in form. You can be as creative as you want to collect email IDs. Just create an opt-in form and any email marketing software from below. 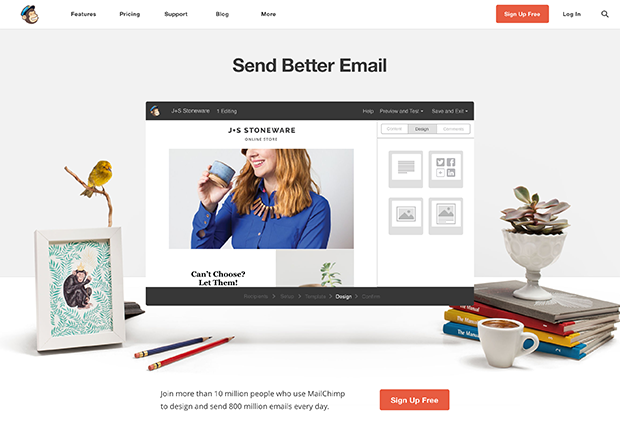 GetResponse allows you to create beautiful & responsive emails. Autoresponders with A/B testing capability are an inbuilt feature of this software. You can send and manage targeted emails to specific subscribers. AWeber is yet another popular email marketing software that takes your email campaign to next level with ease. 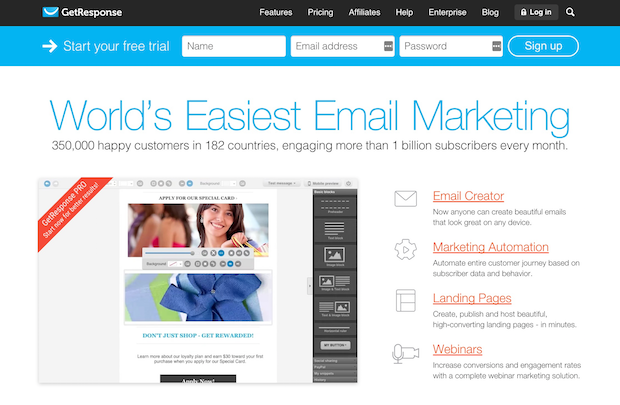 It has some wide range of tools like segments, an email builder, autoresponders and more. Get an exclusive 30-day trial for FREE. Read the free trial FAQ here. 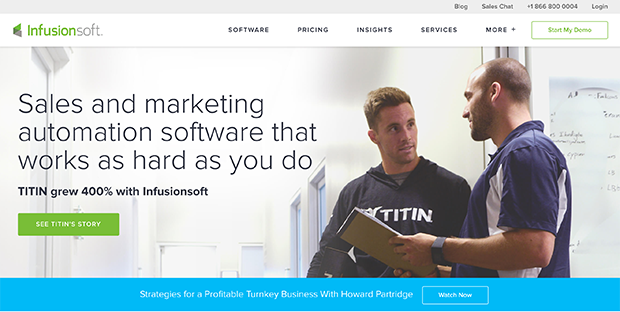 InfusionSoft is a complete CRM & Marketing software for small and medium-size businesses. This is a software with premium features beyond just email marketing hence it doesn’t make sense to compare it with pure email software. It has advanced features for list segmentation, marketing automation, and lead scoring. You have a 14 days free trial and $199/mo thereafter. If you are a pure beginner, MailChimp is best for you. It has some easy to use tools and features. Just because it for beginners, it doesn’t mean it is not up to the mark. You get a free account with 2000 subscribers. The pricing plans are based on the number of email IDs in the list and some advanced features. Isn’t it amazing? Get your free mailchimp account here. 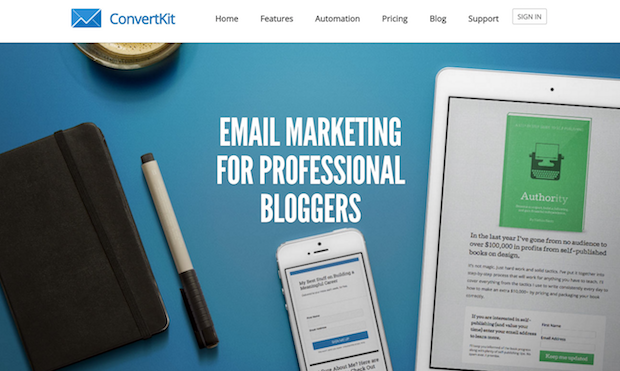 ConvertKit, just like MailChimp is a perfect choice if you are just starting by. It is a right way to get started with building an email list from scratch. Furthermore, it is almost a CRM without the heavy price of “BRAND”, it is pocket-friendly and equally effective. Get your FREE & exclusive 14-Day trial, & it is $29/mo for 1000 subscribers thereafter. Optin Monster helps you create smart A/B testing forms. You can create dynamic, beautiful and powerful, personalized and targeted opt-in forms. Furthermore, you can embed these forms anywhere on your website to collect emails. You get an easy opt-in form builder that eliminates the reason to hire a developer to do the same. Furthermore, if you have a WordPress website, you also get the official plugin. You can get a starter plan is as cheap as $9/mo for beginners. Get Opt-in monster for your website from here. You know what is email marketing, you know that it’s important and hence you want to use this way to grow your audience. Every email you send is not going to be relevant to everyone you send that email to. Most of the times you have to figure out which email will be relevant to whom. Make sure you have properly arranged database(as per user interest, behavior, gender, age etc) which you can understand and utilize easily. Then you should design templates for each group and make sure it makes sense to every group depending upon their interest. Spend some time experimenting and learning the response and interaction with each email you send. This will give you a clear idea of what people in your list like and what they don’t. May be a survey would be handy in such case. Knowing the your intent of the email and the intent of your subscribers. Knowing these two will help you draft a clear, measurable and conveying email everytime. Be simple and straight, add wherever you can, add humor, eye catchy content, images etc. Anything creative you can think will help you convey your message and retain the subscribers. I understand email delivering frequency is important and it should be consistent. But if the email doesn’t add value to your subscribers, it is of not use. Once, twice and done, they’ll straight away unsubscribe it. You don’t want that. Conclude you email with a CTA. It can be anything that confirms your message being conveyed rightly. If you have rightly delivered your message, the user will definitely take action on the CTA you’ve set. Be it directing them to the new blog post, a sign up for an event, webinar or anything else or watching the new video you just posted. It can be anything you can think of and create. CTAs are technically(to some extent) confirmation that you have done your job right. A appealing subject line is the key to a good open rate. Many people including you and me open an email looking at the subject line. This doesn’t mean you have a click bait as the subject line. You’ll end in the spam folder of lose a subscriber. Subject line are meant to give a glimpse of what the email is about, you just have to make it sensational and catchy. Create some sense of curiosity, excitement and urgency exactly like you do in writing a title of a blog post. Subject lines are responsibility, make it count. Spam filters in most of the email service providers are getting smarter day by day. There are hundreds of terms you should avoid using in anywhere in an email to avoid landing in the spam box instead of inbox. Key terms like Risk free, free, make $, 100% free, fast cash and many more are in the red alert zone. Stay away from them. Wouldn’t it be magical if you can draft an email that is valuable and catchy at the same time? Using bright colors, bullet points, HD images or graphics and keeping it short definitely qualifies to be called as a eye-catchy email. 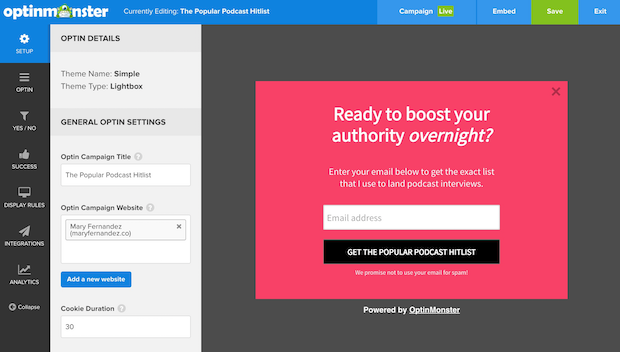 Give your subscribers as eye candy that will not make them regret to subscribe to your work. # 4 Mobile Mobile Mobile! The metrics are not for filling the gaps on the table or occupy space on your database. They are there to give you a detailed insight about the user interaction. The open rates, CTR, shares etc can help you determine which email(s) are doing better than the others. Furthermore, this can be a great input for your A/B testing. With help of A/B split testing, you can send two variations of the same email to two different group of your list(which you have to prepare) to notice the response and interaction each of it gets. This is going to help you to analyze the type of email(s) or campaigns(s) your subscribers are more likely to get engaged with. A/B testing is a great way to improve the performance of your overall/individual campaign. If you don’t have social media share buttons, then you are missing a big-time chance to grow your reach. If you hit the right chords and grab the attention of the subscribers, you can get the privilege share a space on their social media timeline. Give them a content they’ll feel proud to share on their social network. Humans have names, treat the subscribers like humans. Use their names in the email to give a personal touch to them. You wouldn’t want someone to address you just with “Hi”, instead you’d love if I address you “Hi Jhon”. Psychology says, if you address people by their names, they are more likely to pay attention to what you have to say or show. Your subscribers definitely want to be in touch with you, that’s why took time out to subscribe to your list. Make this count and serve them what they deserve. Email marketing is like a boxing game, you Jab Jab Jab and then give a hook. Here, the Jab is giving and a hook is asking something in return. Make sure you give a lot of value to them and in return ask what you want and they are more likely to give without hesitation. But as the first step, you should focus only on adding value to your user/subscribers. Over to you. What do you think of email marketing for your digital marketing campaign? Have you been using any of the tools above? Which tip are you going to use it next? Is it the A/B testing or have an eye catchy subject line? Let me know in the comment section below. Do you know someone who’s looking for this information? Share this with them. And if you find this post useful please share on your social network too.